HomeBlogWhen will this tooth fall out? When will this tooth fall out? Kids love to talk about teeth. Our youngest patients love to talk about how many teeth they have. And our bigger patients love to talk about how many teeth are falling out. Kids love a loose tooth. They love to discuss them. They love to wiggle them. They love to talk about which of their friends have one. And they love to know when their next tooth will fall out because they love to know when the tooth fairy is coming to visit. The next time your child asks about when a particular tooth will fall out, you can refer to the charts below to provide a dentist approved answer. 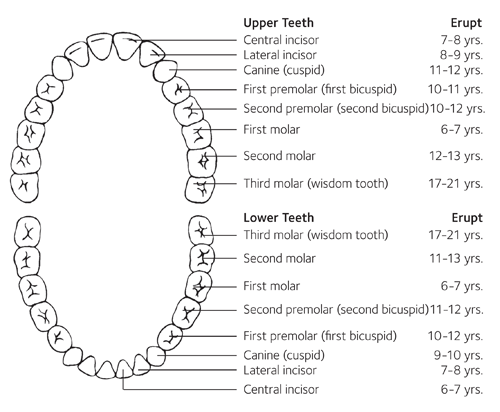 The first chart shows the twenty primary or “baby” teeth. 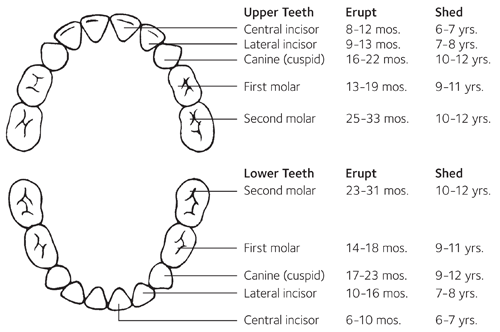 For each tooth, the age at which the tooth first grows in is listed in the second column as the age of eruption. The third column provides the age at which each of the teeth generally fall out or shed. Keep in mind that the numbers listed are only averages. Some children will grow or lose a tooth outside of the age ranges listed and it is still considered normal and does not necessarily indicate any problem. The second chart shows the thirty two permanent or “adult” teeth. Once again, the age range listed for eruption is an average range and many children have teeth growing at ages outside of those listed without any issues. As always, call our office if you have any questions about your child’s particular situation. And talk to your children about their teeth, it’s probably one of their favorite topics!